Newly re-elected MSP for Banffshire & Buchan Coast, Stewart Stevenson has been announced as Minister for the Environment & Climate Change in the new SNP Government. "I am delighted to be part of the Rural Affairs team in the new Scottish Government. "As an early priority we shall be working closely with UK Ministers in particular to ensure that Scottish interests are properly represented in the European Union. "Where we have the powers, we shall seek to work with rural, marine and environmental stakeholders to ensure that we understand and respond to their needs and concerns. "For me personally, this is a superb opportunity to work in Government on a range of issues in which I have personal interest. "I look forward to working with First Minister Alex Salmond and Cabinet Secretary Richard Lochhead and the rest of our strong team." The Scottish Government's new Ministerial team has been announced by First Minister Alex Salmond subject to the necessary parliamentary approval. The number of Ministers is 10 - the same number as in the last parliament. Like the Cabinet Secretaries and Law Officers, each Minister will take their salary at the level of April 1, 2008 both for their Ministerial and MSP salary. This pay freeze has already saved the taxpayer over £100,000, rising to nearly £200,000 by the end of this financial year. Stewart Stevenson, who returns to the Government, will add to this sum by returning the resettlement grant of under £7,000 which he received on leaving last year. Michael Matheson (MSP for Falkirk West), who becomes Minister for Public Health, with Shona Robison moving to the Commonwealth Games and Sport brief within the Health, Wellbeing and Cities Strategy portfolio. Aileen Campbell (MSP for Clydesdale), who joins the team as Minister for Local Government and Planning in the Finance, Employment and Sustainable Growth brief. Alasdair Allan (MSP for the Western Isles), who becomes Minister for Learning and Skills within Michael Russell's portfolio. Dr Allan will also have responsibility for Gaelic and Scots, and is a fluent speaker of both. Angela Constance moves to the Children and Young People brief within the Education and Lifelong Learning brief. Brian Adam (MSP for Aberdeen Donside), who joins the team as Chief Whip and Minister for Parliamentary Business. Roseanna Cunningham becomes Minister for Community Safety and Legal Affairs and also has specific responsibility for tackling sectarianism. She moves from Environment and Climate Change. Fergus Ewing, the previous Community Safety Minister, moves to the post of Minister for Energy, Enterprise and Tourism within John Swinney's portfolio. The previous holder of the post, Jim Mather, stepped down from parliament at the election. Stewart Stevenson returns to the ministerial team as Minister for Environment and Climate Change. In the last Parliament, Mr Stevenson steered through the Climate Change Act, the most ambitious such legislation anywhere in the world. Keith Brown retains responsibility for Transport and also adds Housing to his brief, as Minister for Housing and Transport. 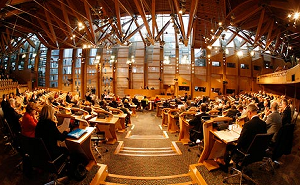 Adam Ingram leaves the government from his role as Children and Early Years minister, having successfully steered the Children's Hearing Act through parliament to make Scotland's unique children's panel system fit for the 21st century, among his many achievements. "This is an excellent team to take Scotland forward while the overall number of Ministers is unchanged, it blends the tried and trusted team which received such strong public endorsement at the election with significant new talent. "Aileen Campbell, Michael Matheson and Alasdair Allan represent a new generation who will bring fresh perspective and energy to government just as tried and tested Ministers such as Roseanna Cunningham and Fergus Ewing will rise to the opportunities and challenges of their new portfolios. "Stewart Stevenson steered Scotland's world-leading climate change legislation through the last parliament, securing consensus right across the chamber, and I am delighted to welcome him back to government in that same role as we turn these ambitious targets into reality. "I wish to pay tribute to the work of Adam Ingram as Minister for Children and Early Years, whose success in improving the protection of Scotland's most vulnerable children, and modernising Scotland's unique Children's Hearing system, is a lasting legacy which will benefit current and future generations. Adam understands the need within a significantly expanded group to create new opportunities for others to show what they can do for Scotland, and I wish him extremely well for the future as a new constituency member." Banffshire & Buchan Coast MSP Stewart Stevenson has welcomed research by Scottish Enterprise into the jobs and economic potential that Carbon Capture and Storage (CCS) technology offers Scotland. 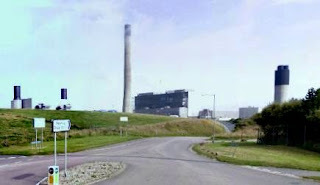 The results of the study which are set to be announced at the All Energy Conference in Aberdeen suggests that up to 937 jobs could be created during the construction and lifetime of a CCS project at Peterhead Power Station, generating £590 million in GVA during the construction of the project and £130 million per annum during its lifetime. The research comes after the proposed CCS project at Peterhead Power Station was recently amongst those put forward by the UK Government to potentially share in European funding worth €4.5 billion. “This invaluable research shows the potential that Carbon Capture has to create jobs and boost the local economy of Peterhead. Its success is important not just for the region, but for the whole of Scotland. “Scotland has enormous capacity to store carbon emissions offshore and is ideally placed to be a world leader in this emerging field. Not only is this good news economically, it will also help Scotland to dramatically lower our carbon emissions and make strong progress towards our world leading climate change targets. The new constituency of Banffshire & Buchan Coast gets its first constituency surgeries next week when MSP Stewart Stevenson will be in Buckie and Cullen. The SNP MSP, who was elected with 67% of the vote on May 5th, has chosen to hold his first surgeries of the new Parliamentary term in the part of the constituency which was formerly in Moray. “Now that the election period is over it has been straight back down to work, answering correspondence and arranging constituency surgeries. “I’m looking forward to being in Cullen and Buckie once again next week but this time carrying out my first official engagements as the area’s new MSP. Note: Surgeries will be held in Buckie and Cullen on Monday 23 May. Any constituent wishing an appointment to see their MSP should telephone the Constituency Office on 01779 470444. Banffshire & Buchan Coast MSP Stewart Stevenson has hailed Turriff Motorfest as a success after attending the event yesterday. “Safety on our roads is a significant issue. Events like Motorfest are an excellent way of engaging the attention of the public and I was delighted to see the large attendance on Sunday. “The displays and stands demonstrated the effects of carelessness and inattention. Banffshire & Buchan Coast MSP Stewart Stevenson has been formally sworn in as the constituency MSP for the redrawn Banffshire & Buchan Coast seat, having previously represented Banff & Buchan for almost 10 years. Mr Stevenson won his seat with 16,812 votes or 67.24% of the vote, the highest share of the vote of any seat in this election. 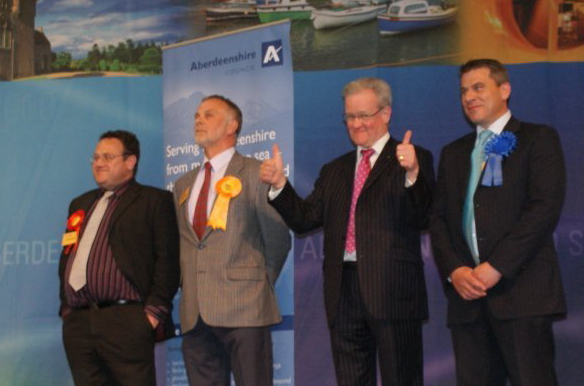 “I am delighted to have taken my place as the constituency MSP for the new seat of Banffshire & Buchan Coast. I have been representing much of the area for the past decade, and while I am of course saddened to no longer represent some areas I previously did thanks to boundary changes, I am looking forward to working hard for the new communities that have been added to the seat. “Gaining the highest share of the vote of any seat in this election is an absolute honour and I am determined to repay the faith in me that voters in Banffshire & Buchan Coast have shown. Newly elected SNP MSP for Banffshire & Buchan Coast, Stewart Stevenson, and SNP MP for Moray, Angus Robertson, have both congratulated Buckie Thistle on retaining the Highland League Championship. “For the season to come down to the final minutes of the final game between two clubs separated by only 20 miles could not have been more nailbiting. “I have been following the fortunes of Moray’s 5 Highland League teams throughout the season and I am delighted that a local team has won the title. It is doubly impressive for Buckie, given it is a back-to-back title win for them. "I am delighted with the very substantial endorsement of the SNP delivered by electors in Banffshire & Buchan Coast. "The campaign was a real debate of ideas with my Labour, Conservative and Liberal Democrat opponents and led to a decisive victory for the SNP. The 67.2% of electors supporting me is the highest in the new Parliament and shows the continuing faith among local folk in our ability to deliver. "I thank each of my opponents for the constructive spirit in which they approached the election and for their contribution to the democratic process. I wish them well and hope they enjoyed campaigning." "Alex Salmond has proved himself in office during the first term of SNP Government. "The unambiguous endorsement of the Government at this election lays the foundations for decisive action on the economy and in tackling alcohol abuse. "We shall continue to work with other parties in Parliament to ensure that our decisions reflect the widest possible range of views. "Lessons learned as a minority Government will continue to influence how we will conduct ourselves now that we have an overall majority." "I thank all who voted on Thusday. This is the third consecutive election where my vote has increased. I shall work hard to build on the personal vote of confidence you have given me."